Electronic Kit School. - Maybe you are usually using the popular time IC like LM555 in this time. 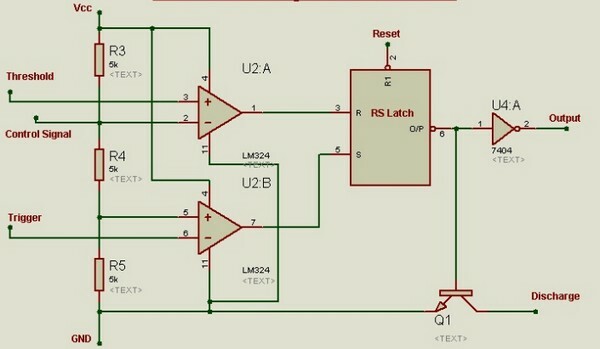 But, do you know the internal block diagram of this 555 timer IC look like? Yes, when you want to know more about the internal circuit diagram of 555 timer IC you should read this article. When you using Proteus software, you can re draw the internal circuit of 555 timer IC look like shown in Figure 1 below. The internal diagram of this IC need some component like IC Lm324, RS Latch 7404 IC and others component. Circuit like in Figure 1 above show you about the internal circuit diagram of 555 timer IC using the main LM324 and 7404 IC. From Circuitstoday site describe that 555-Timer is one of the most popular and mostly used ICs. It best suits for timing/timekeeping related circuits. It consists of two operational amplifiers operated in an open loop or comparator mode, RS Latch with additional Reset input, a discharge transistor, an inverting buffer and an amplifier in the output stage. It has a voltage divider circuit with three 5K Ohm resistors in series. 556 is a dual timer IC.